One of the tremendous benefits of the Adventure Game Engine (or AGE) system is how quickly we’ve developed a diversity of applications for it. Not only does this give us a bunch of great games to play, but allows us to mix-and-match them to get ourselves a breadth of options beyond that of any single game. Today, we’re going to start a series that shows this off a little. The Fantasy AGE Bestiary is an excellent book full of great monsters, horrors, and adversaries for your Fantasy AGE heroes. 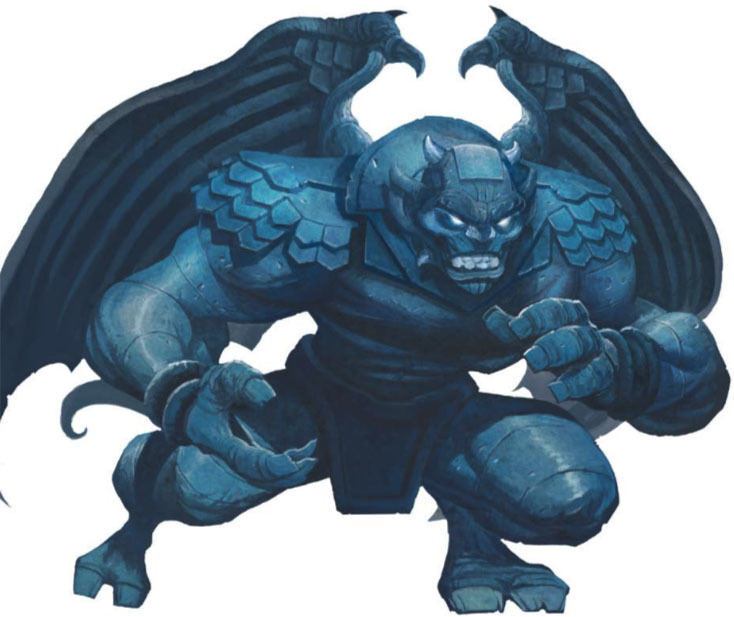 But its utility isn’t limited to Fantasy AGE campaigns – we’re going to talk a little about how these monsters might fit into the romantic fantasy setting of Blue Rose. This is the second of three articles taking these critters, one at a time, and discussing where they might fit into Blue Rose’s setting, and what (if any) mechanical adjustments need to be made to make room for them. See the first part here. Fomoiri: Among the terrors dwelling in the rainy, wet moors of Drunac are the fomoiri, having inherited their worship of darkfiends from the ancient warlock lords who once ruled that blasted landscape. Rezean guardians watch the boundary between the horselands and those high moors, watchful for raiding parties of these terrors. Gargoyle: During the attack on Kern and its Lich King, the valiant warriors of Aldis learned to their sorrow that the masters of Kern had long ago subverted the natural tendencies of the strange, stony gargoyles, impelling them through subterfuge and magic to defend the fortresses and bulwarks of Kern. Though they are not overtly evil, they have been made to serve evil over the years, and it is said that the Shadowed Seven continue this practice. In contrast, however, Queen Jaellin and her consort Kalyran refused to slay the gargoyle defenders of the Lich King’s own demesnes, showing them compassion. In return, the small clutch of gargoyles swore to defend the Lady of the Hart, and even now have taken up residence in the highest places of the Palace in the city of Aldis. Slumbering Eaters, or Sleeping Ghouls (Ghoul): Though sometimes called ghouls, these horrors are not the undead things typically named such. An ancient creation of sorcerers, the szalychta (or “locust-eaters”) have a cycle of existence in Aldea. For decades, they hibernate in torporous stasis, unaware and seemingly dead. Then, something triggers and they awaken, ravenous. They swarm up out of their subterranean expanses, sometimes even digging up from beneath graveyards, causing strange sinkholes where graves used to be. There, they feast on the dead, but these are inevitably insufficient to sate the creatures, who then come boiling up out of the sinkholes to feast on the living. Different “clusters” of ghouls have different cycles, ranging in ten to fifty year increments. Groi: Found naturally throughout the Golgan Badlands, and domesticated as guardians and consumers of offal throughout Kern, some merchants have tried to sell them outside of those areas. Given that domestication of grois is less a matter of actually taming them and more about keeping them so well-fed that they are largely quiescent, these attempts almost always end in tragedy. Grootslang: Largely thought to be a bit of folklore, the Royal College in Aldis has a stuffed specimen (which many cynics claim can’t be real). Unfortunately, the beast is altogether too genuine, although found almost exclusively throughout the expanses of Wyss. Some Finest patrols, however, report seeing something that greatly resembles a grootslang around one of the ancient Shadow-haunted ruins of the Veran Marsh. Iron Maiden: If there is anything that is proof of the horrors the ancient Sorcerer Kings were capable of, it is surely the iron maiden. Occasional excavations still unearth these horrors today in places around Aldis and neighboring lands, and the Shadowed Seven of Kern are known to have several that they trade amongst themselves like favors. It is also said that Jarzon’s masters have used these in the past, though the modern Church forbids them as the work of Shadow…although no one is exactly sure what happened to those horrors. Knifehound: Though largely wiped out in Aldis, Jarzon, and Kern, wild packs of knifehounds still roam many other places in Aldea. They are rarer in the horselands of Rezea, though still a problem sometimes. They are far denser in places like Drunac, the Golgan Badlands, and the Shadow Barrens. Living Doll: Though named for children’s playthings, the possession of inanimate bodies by the anguished dead is neither jest nor firelight tale. Though there are scholars with their own ideas why it happens, in truth no one really understands exactly why it is some undead spirits take the bodies of dolls, mannequins, and even statuary. Man-o-War: One of the bits of lore recovered from Jarek’s lore hoards was the creation of these monstrosities, and the Shadowed Seven – lacking the old Lich King’s arcane might – have seen the benefit of creating them. In recent years, Kernish resistance speak of the “armory wagons,” tarpaulin-covered wagons that seem to merely contain piles of armaments. Attempting to raid them to arm their insurgencies, the resistance fighters tell tales of those very armaments rising of their own accord into these horrid, shambling shapes, and reaping the lives of the rebels. Merfolk: Denizens of the deepest watery abysses where even the sea folk cannot live, merfolk are strange. Sea folk scholars claim that like night people, they were the creations of sorcerers in ages past. While many of them are indeed vicious, bloodthirsty predators fond of the flesh of other folk who are capable of battling the largest of sharks, others are more peaceable and curious about settlements. They are clearly a nomadic folk, with bands traveling in wide circuits that usually hug the sea floors. Minotaur: The few known clans of minotaurs make their homes in the Golgan Badlands, but even these claim that they hail from a land of mountain peaks far to the east of the Badlands. Indeed, the profusion of confusing labyrinths and mazes hewn out of the stone canyons of the Badlands speak to the long occupation of these bull-folk tribes, who frequently send out raiding parties into Jarzon, Aldis, and (with the death of the Lich King Jarek) into Kern as well. Morlock: The actual origins of the morlocks is unknown. Though they were among the strange terrors employed by the Sorcerer Kings, it is clear they predate even that corrupt magocracy. With the fall of the Sorcerer Kings, morlocks fled once more into the under-kingdom warrens they’d always occupied, and are still discovered occasionally, in the wake of earthquakes and mining cave-ins, and one thing is clear: their hunger and viciousness has not abated in the least. Mothman: Found throughout the Veran Marsh, southeast Aldis, and the forests of eastern Jarzon, these strange nocturnal predators are crafty, accustomed to hiding the traces of their hunting. Many strange and inexplicable disappearances are the results of a successful mothman on the hunt, and even the best investigators of the Finest have trouble ascertaining their work. Nymph: Unlike many of the other fey that adept summoners are familiar with, nymphs lie in close communion with the natural world. Many of them remain within wild spaces entirely, eschewing the otherworldly gathering spots of their fey kin. Their revelries lure mortals in and change lives…or sometimes end them in wild bacchanals. Night Terror: Mainlanders often doubt the existence of such things, even when warned outright by sailors and the folk of the islands and archipelagos in the Western Ocean. But there are other legends attached to these horrors, such as the claims that certain sorceresses in Lar’tya know how to curse someone so that they attract night terrors within dozens of miles of them, enraging them as surely as blood in the water enrages their mundane kin.